Kawagoe recently has become famous because popular TV drama is shot in this town. It takes only half an hour from Ikebukuro by express train of Tobu Tojo Line. It is very interesting city to feel the atmosphere of Edo era. From Kawagoe Station, there are two lines of buses to go around the sightseeing spots. One day ticket cost 300 - 500 yen. The most famous spot is the Kurazukuri zone (old storehouse zone). About 30 old storehouse (kura) have remained and they give the town the atmosphere of Edo era. The oldest storehouse was built in 1792. You can enter some of the Kura. Many Kura are now shops or restaurants. 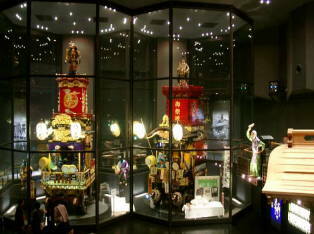 And there are a few Kura museums which show the life style of Edo era. Kawagoe Matsuri Kaikan, Kawagoe Festival Museum is also worth to visit. Kawagoe Festival is very vigorous with big floats which have folk music players and dancers. You can see two of the real floats in the museum. You also can see the video of the festival on the big screen. In the middle of the town, there is a old clock tower called Tokinokane. Original one was built 400 years ago, but this one was built in 1893 after the fire. Behind the main street, there is Kashiya Yokocho where you can buy nostalgic candies. Most of the Japanese used to buy candies at this type of shop in their childhood. Unfortunately, these kind of shops have almost disappeared. Kawagoe is also know as a town of potato (satsumaimo). You can find many sweets and cookies made by potato. Some restaurants prepare the various dishes using potato. Another popular spot to visit is Kitain Temple. It was first founded in 9th century during Heian era, but became very important temple during Tokugawa Shogunate. In 1638, it was reconstructed by powerful monk, Tenkai. The birth room of the third shogun Iemitsu and dressing room of his nunny Kasuganotsubone were relocated here. You can see the rooms (photo not allowed). The garden from these rooms is beautiful. 500 Rakan (stone buddhism statue) are also worth seeing. The expressions of them are very unique which express the everyday life style. but it is underconstruction until March 2011.